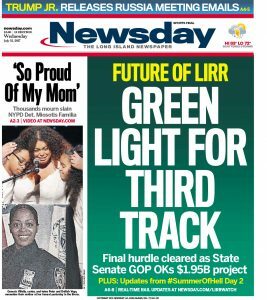 State Senate Republicans signed off Tuesday on public funding for a third track for the Long Island Rail Road, removing the last hurdle for the long-touted project. With the Assembly and Gov. Andrew M. Cuomo already on board, the decision gives the green light to a 9.8-mile track corridor from Floral Park to Hicksville. It also gives a political victory to the governor, who championed the track. Senate Majority Leader John Flanagan (R-East Northport) announced the action while noting that the Metropolitan Transportation Authority, which runs the LIRR, had agreed to upgrades, including renovated station stops and new parking garages in impacted communities, along with an updated signal system for Penn Station. Late Tuesday, he said the Senate’s representative to a politically obscure yet critical control board sent a formal letter approving the $1.95 billion third track project. Flanagan’s announcement came less than two weeks after the potential of a Senate veto — based on local residents’ concerns about construction, traffic and other issues — caused the MTA to temporarily withdraw the third track plan from consideration by the Capital Program Review Board. The Senate, Assembly and Cuomo all have representatives on the panel who can single-handedly block a funding proposal. But the same day the MTA withdrew the plan, two of the staunchest opponents of the third track — the villages of New Hyde Park and Floral Park — said they had come to an agreement with the MTA regarding quality-of-life concerns and now would support it. That appeared to clear the way for the Senate to acquiesce. “I’m pleased that communities impacted by the proposed ‘third track’ will receive the safety and quality-of-life upgrades they have said were critical,” Flanagan said in a statement. Cuomo applauded the Senate’s decision. Despite Flanagan’s backing, another Senate critic of the plan said she still has “serious concerns” about the impact of the project on nearby residents. Sen. Elaine Phillips (R-Flower Hill) said the nearly $2 billion should be spent on more immediate transit needs. Scores of Floral Park and New Hyde Park residents had spoken against the project — which could last several years and impact traffic among other things — at public hearings. 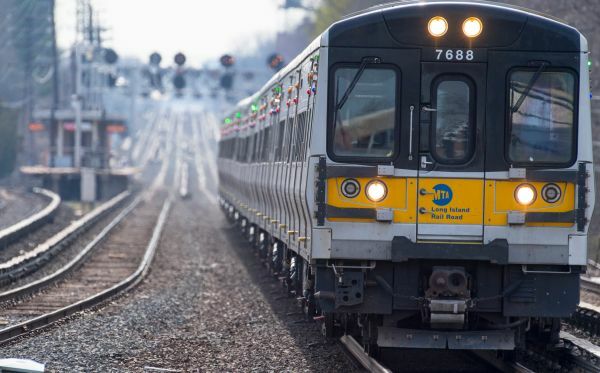 The LIRR promised to minimize the potential impacts by building retaining walls and sound barrier walls adjacent to the new track, monitoring noise and vibrations, and studying potential traffic improvements. Supporters say the third track will be a major boon to the region, allowing the LIRR to run more trains in both directions, bounce back more quickly from service disruptions, create jobs, boost property values and keep more young people in Nassau and Suffolk counties. Republicans had faced pressure from business groups that favor the track. The Floral Park and New Hyde Park mayors could not be reached Tuesday night. 2008: After years of planning, the LIRR abandons its third track plan amid local opposition. January 2016: Cuomo resurrects the plan, promising to make it more acceptable for affected communities. November 2016: LIRR issues 2,200-page draft environmental impact statement, sets a Jan. 31 deadline for public comment. January 2017: First of six public hearings about the third-track expansion project held Jan. 17 in Westbury. May 2017: The MTA amends its $30 billion, five-year capital program to include the $2 billion capital program and submits it to the state Capital Program Review Board for consideration. June 2017: Facing a potential veto of the third track plan, the MTA withdraws and resubmits its proposed amendment, buying extra time for Cuomo to negotiate with Senate Republicans who have raised concerns about the project. July 2017: Senate Majority Leader John Flanagan pledges his support for the third track, clearing the way for its approval.